Did some more work on the white. There's a lot of feathers on those wings....might have to take breaks after each one of these winged gold bastards to maintain sanity. DaisyDuke and Old Man78 like this. I managed to find the time to get my first SG model to a point where it could be based, little things like the chest scroll being empty at the moment still need to be done. 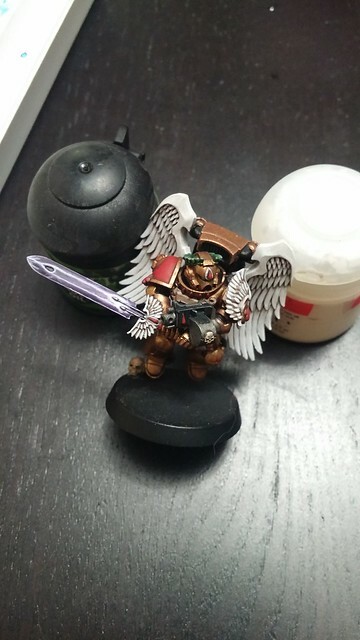 I've kinda fell into a rhythm with the wings, but really and truly I think I hit each feather probably 6 or 7 times with my brush from black to white. 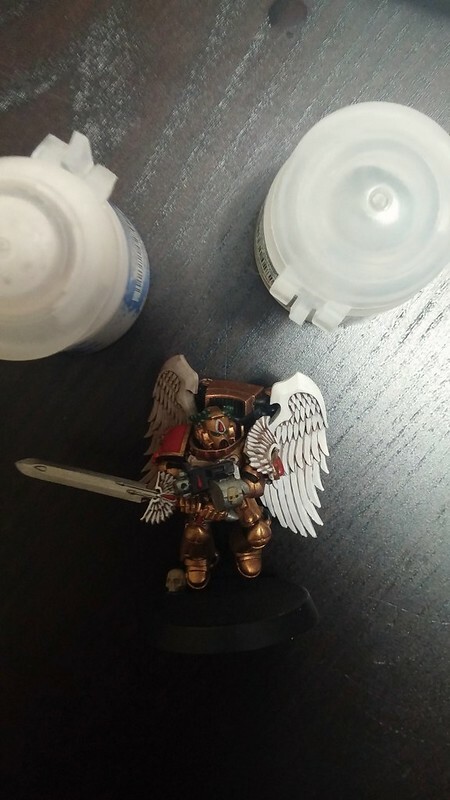 Glad I only have 10 on these guys Guess I'll have to decide when I get to my Sternguard and Vets if I want them to have white or black iconography. Decided to go with purple for the power weapons/plasma since blue is the prominent colour of my Necron army. Finished building for now, lots more to go but I'm in a good place to get some infantry painted up now. 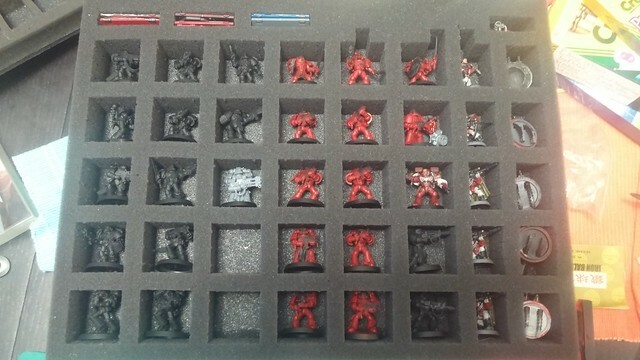 This is the tray I've got to work through aside from my SG and jump pack DC. Left hand side is 12 foot DC and right hand side is a freshly and consistently (praise be to the Emperor) reddened pair of Sternguard squads as well as a Sanguinary Novitiate and Company Champion (ignore the Scouts and Razorback turrets for the time being). 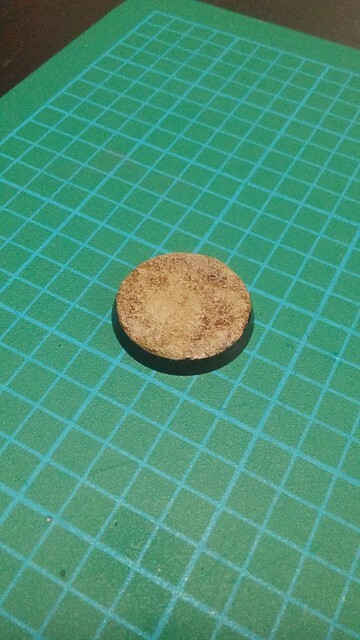 I bought to wrong damn texture paint at the store and since I'm not going to be able to return to that location potentially until January I've sucked it up and tested a base. Without getting into what I had initially planned at all, this is Armaggeddon Dust washed with Seraphim Sepia then drybrushed with classic Bleached Bone (gotta use it somewhere). Considering painting the rim with XV-88 (again just to use the paint) but have traditionally done black. Anyone have any thoughts on this option? 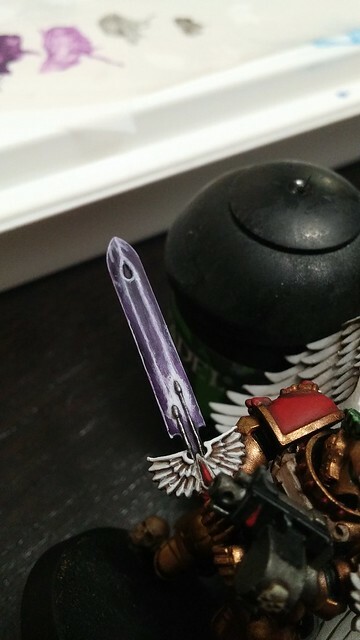 Also it was suggested to me that I try a warmer purple for my power weapons but I'm at a loss, using Citadel paints, with how to accomplish such a thing. Maybe some red wash mixed in there somewhere...? I do like the idea. I think the reason it sticks out to me so much is that it's such a cold colour on an otherwise warm palette. On the Armageddon Dust, I use it for my Death Guard/Nurgle base. I’ll wash it with earthshade, sepia or fleshshade then drybrush with bone. This gives a varied but consistent set of bases. Though, I use this for Nurgle things I usually glob Nurgle's Rot in places as well. I’ve liked how it’s turned out. Though sometimes I’ll use the other Armageddon cracked paint (forget the name) in the exact same way, or use them together. Again adds variety but maintains a consistent style. I'm going to try and base a couple models, just got a few adapters for the models whose feet were too dainty to break off old 25's; now my whole army is on 32's and it's glorious. Hopefully will have a couple to show soon.